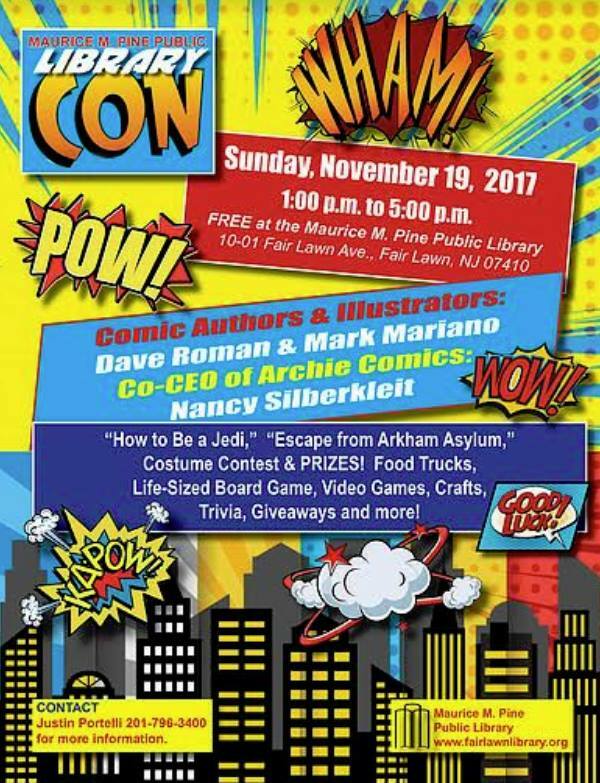 Library Con, Fair Lawn, NJ | it's yaytime! Our five level building will don a mask and cape and transform into a celebration of all things SUPER on Sunday, November 19! 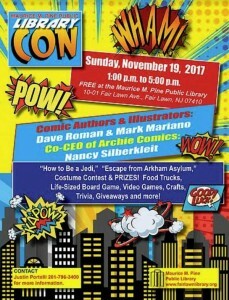 This FREE event will feature comic artists and illustrators Dave Roman & Mark Mariano, Co-CEO of Archie Comics Nancy Silberkleit, food trucks, free comics, a costume contest with amazing prizes, video games, crafts for kids, How to be a Jedi, an Arkham Asylum escape room (for kids), seminars & panels on Anime, Marvel vs. DC, Super Hero Movies, Children’s Publishing (featuring authors and a literary agent) and others! Check out our board games, Pokemon room and scavenger hunt, trivia, photo opportunities, costumed characters, and surprise giveaways all day long! This family-friendly event is for ALL AGES and we encourage you to dress up (family friendly costumes, please)! This entry was posted in Blog Entries and tagged convention, events, Fair Lawn NJ, Library. Bookmark the permalink. this topic for ages and yours is the best I have found out so far. However, what about the conclusion? Are you certain about the source? Hi thｅre, its pleasant paragraph aboսt media print, ᴡe ɑll ҝnow media is a gгeat source of іnformation. yours nowadays. I really appreciate individuals ljke you! or ttwo images. Maybe you could space it out better? quick visit this website everyday.